"All good and professionally done. I would recommend the Seminar to any Flight Instructor"
"All very interesting and delivered in a highly professional manner. Thank you"
Helicopter Services at Wycombe Air Park. These seminars are run by Geoff Day and are run approx every 3 months at Helicopter Services Ltd, Wycombe Air Park (Booker). They are 2-day seminars, are only open and applicable to helicopter instructors and usually held on Tuesdays and Wednesdays. Please contact Helicopter Services on 01494 513166 or email info@helicopterservices.co.uk for details. Helicentre Aviation Ltd at Leicester Airport for dates and booking see here. (3) pass an assessment of competence in accordance with FCL.935, within the 12 months preceding the expiry date of the FI certificate. For at least each alternate subsequent revalidation the holder shall have to pass an assessment of competence in accordance with FCL.935. (2) pass an assessment of competence in accordance with FCL.935. Remember that every other renewal must include an assessment of competence. Full details can be found in EASA Part FCL and the Air Navigation Order 2016. The AOPA Flight Instructor Revalidation Seminar for FI(A) meets the requirements of EASA AMC1 FCL.940.FI(a)(2). UK,and EU Instructors may attend this Seminar. AOPA UK is a CAA approved Training Organisation, Number PTO-107 and meets the requirements of EASA-Part FCL for Flight Instructor Rating renewal. "I found the whole experience extremely beneficial, all the presenters were excellent, the information well structured and the timetable very well balanced and controlled.The admin was also highly efficient and the whole seminar well worth the money. Thank you for accommodating me at short notice." Will I need to give a presentation? Yes, if you are chosen — on arrival you will be asked what topic you will give a short presentation on. 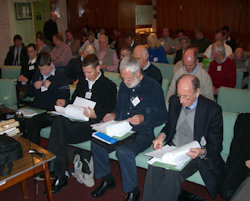 Approximately 50% of the delegates will be chosen to give their presentation to small groups in the form of a briefing. The aim is to have a variety of presentations on the main topics. Current AOPA(UK) Instructor members price is £240 (£200 plus VAT @ 20% of £40). 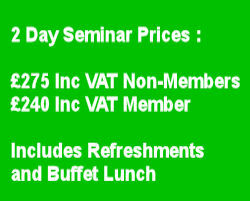 "Excellent Seminar at right level. Friendly and professional presenters who ran to time"
Lectures and presentations over two days, morning and afternoon refreshments and a buffet lunch. And a Certificate of Attendance. Please note that we no longer cover FI(H) renewals/revalidations at AOPA Seminars. The two-day seminars last six hours each day. Under EASA Rules you may attend a seminar any time during the validity of your FI Rating. 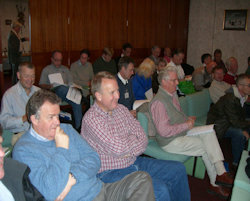 For more information regarding the AOPA Instructor Seminar contact John Pett by email or phone 07754 780 335. All attendees must book and pay in advance as there will be no registrations accepted at the door on the day. You can book your place online now for AOPA Seminars. Just click the "Book Now" button for both secure online and offline payment options.